I always say, when someone gets engaged, you should immediately gift them a box of thank you cards. Random gifts of congratulations will arrive and, honestly, it's easy to lose track of who you need to thank (while you're looking at venues, creating a guest list, deciding on invitations, picking colors, and you know, the million other things you need to do once you're engaged). So it's really nice for a bride who has already been there to give a little gift for the newly engaged bride-to-be. I put together a really simple DIY Engagement Gift Idea. It's actually from items I had at home already, which means you probably do too. 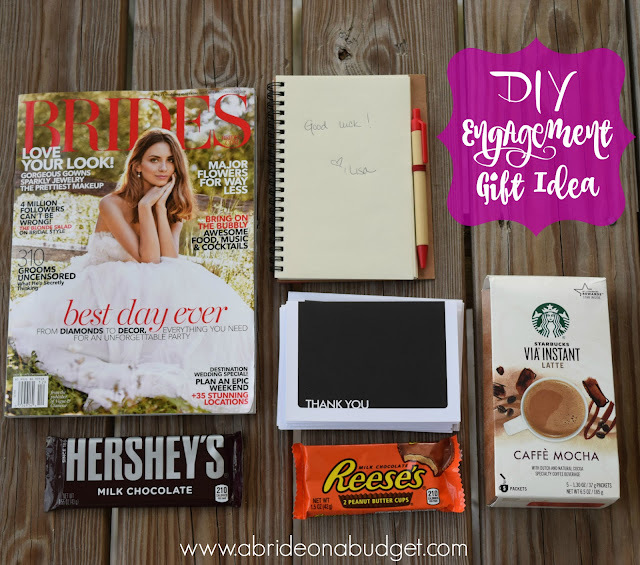 As soon as you get the call from your friend that she's engaged, you can put this together and have it ready to give her the very next day. Write a note in the first page of the notebook. You can go with a long letter of encouragement or a simple "I'm here if you need anything." But, when you offer that, be prepared for the 3am phone calls (because yes, a bride will make those). Put all the items in a bag (or box if you're mailing this) and include a card from you to the bride. I actually had a really cute Hallmark card that goes perfectly with this gift. The front says You have got to take a break from Pinterest and the inside says Take a break from everything except fun today. Seriously, how many times have you wanted to tell a bride to step away from the stress of the perfect Pinterest wedding and just enjoy the planning because it goes by so quickly. This card definitely says that for you. BRIDAL BABBLE: What else would you add to this engagement gift idea? This is so wonderful, and I love the package you decided to put together and yes we all have to take a break, breath, take a swim or sleep that extra hour..
What a wonderful gift idea for the bride to be. It's both very thoughtful land practical. No doubt any newly engaged woman would love to receive this. What a wonderful idea to make an engagement box. I'm sure any bride to be would love to have one of these. I think any bride would be delighted to receive this gift! Love the items that are so thoughtful, yet inexpensive and totally helpful too! Thanks for sharing. This is such a fantastic engagement gift idea. I can picture the bridge to be flipping through the magazine sipping on a coffee while enjoying that yummy chocolate bar. Very cute little gift - how about an inexpensive bottle of wine or some cozy socks to read the magazine with! Found you at Home Matters link up! Ooh a small bottle of wine would be a great addition. And I love cozy socks, so I would like those too! What a wonderful gift this is. I agree that a bottle of wine or champagne to celebrate would be a nice addition. Thanks so much for sharing this over at Let's Get Real. You always have the best ideas.